I've been on about trying canning for a long time and since Kirsty (from Rural Retreat Restoration) has learnt how to do it I thought she'd be the perfect person to teach me. Yesterday was a wet and miserable afternoon, so perfect to meet up with a friend and spend it preserving fruit in good company. 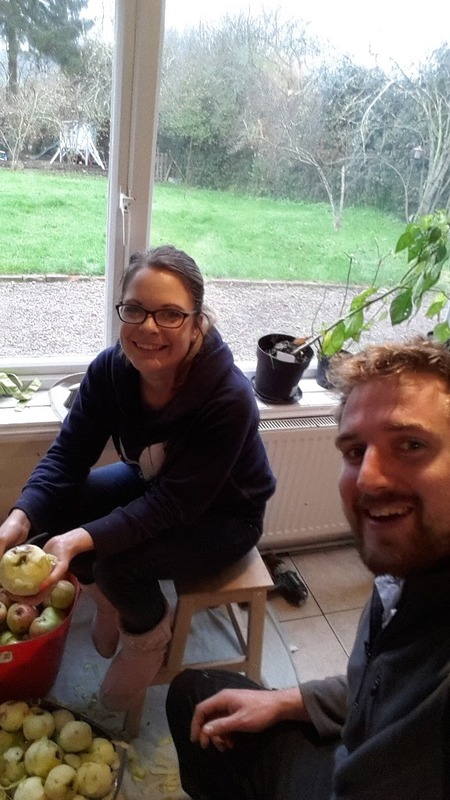 In them morning I'd picked a good amount of cooking apples out of one of the fields I rent, Howgate Wonder, and bought them round to Kirsty's house. We then set to work pealing, coring and chopping them up. 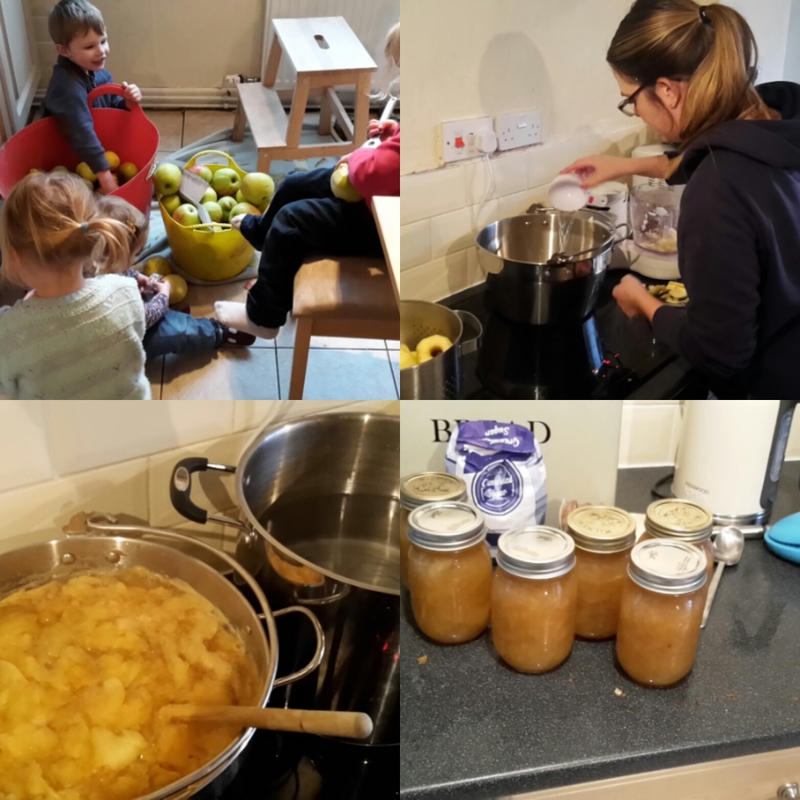 The first batch was for apple pie filling (although more likely to be crumble for me) with an American recipe off the internet, it was quite sweet! Kirsty set to it like she'd been canning all here life and we soon had some jars canned. Unfortunately a few of my Kilner lids kinked so we had to redo a couple of them, but we had space in the pan for the next batch so it wan't the end of the world. It seems the Ball brand are slightly better quality. The children were being brilliant and quite happy just playing with the apple. We made 13 jars of the pie filling and then made a batch of apples in a light syrup, just five jars this time but I imagine it would be great ladled over custard! We were pleased with our afternoons work and although we maybe didn't make as much as some of the amounts I see on some American blogs, we did have four children to deal with as well! I think I might be addicted now and want to can more! Anyone know the best place to by the mason jars in the UK? They seem expensive everywhere I look over here and I'd like to buy a good quantity of them, as well as a pressure canner at some point as well! Labels: canning, preserving food, preserving fruit. I've been bottling like this for years. I use the Le Parfait jars, capsules, and screw tops, system. They are available in every supermarket etc here. I do enough Paté, and Tomato based preserves to last for the whole year. ?=How much are the jars over there? They're expensive here as not enough people do it. but... they don't do the Familia Wiss jars from Le Parfait that Cro is talking about. We use those for dehydrated foods... we use the clamp-down rubber ring type for bottling. But a pack of six Familia Wiss 750ml jars is currently less than 13€s in our local Intermarché... at todays exchange rate... less than a Tenner!! clamp lid down before you remove it from the oven. Allow to cool, label and store. The seal is so good this way that a Mole wrench is often the only way to stretch the rubber ring enough to pop the seal! but come back loaded with jars rather than wine!! I thikn I'll start doing the same. I want to to build a good stock of them. Good job! Apples are fun to can and you will enjoy them this winter. Good that someone was around to show you how to do it. I still use some of my great grandparents jars from 100 years ago and most of my equipment is 30 years old or so. It's not a popular thing over here at all! So I'll have to buy most of it new. The pint sized jars are £2.50 each so it's quite an investment. i love to can. sometimes i make as few as 2 jars of something. 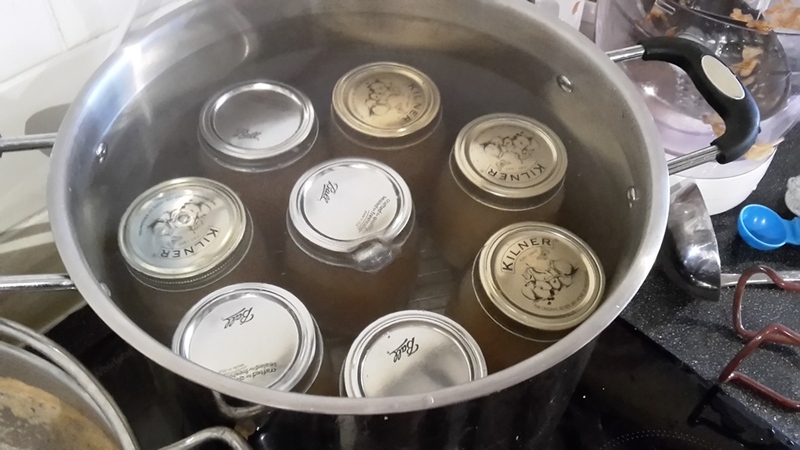 i find canning a lot at once a big task and i end up not using all of it. so if i am making spaghetti sauce for example, i'll make double the recipe and can the extra. it's easy and the pantry fills up quickly. Now I've done it I think I'll be doing it a lot more. I like the idea of using the smaller jars and making things I can take to work! The idea of doing twice as much for dinner and canning it really apeals as well! Hint from an old canner with a meaty fist: If your lids are 'kinking' you're probably screwing the bands down way too tightly. Just 'finger tip tight' is all you want. The air must be able to escape during processing. If the lid is on too tightly, air pressure will build up and cause damage before it can escape. Been there done that, many times. Go lightly and you'll be happier! My wife and I try to grow and preserve as much of our food as possible. Been doing it for nearly 45 years now! Fun and high quality food, plus very satisfying work (once you're done). Ah, I should say that's what I was doing then! Thanks for that! next time I'll have a lighter touch. I break every can opener I ever use as well! Now you're hooked - right :) Nothing better than providing for the family out of season. It's brilliant, I want a pressure canner so I can have whole meals ready to go! What you did is called "small batch canning." It is the perfect way to fill up your pantry, especially if you have anything else to do that day. Older canners often do this. Ball is the best brand of lids. 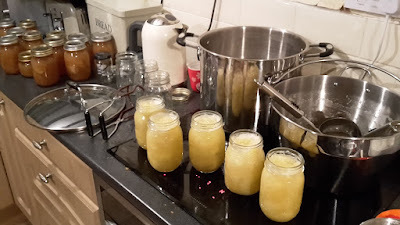 Ball and Kerr are the only jars I use, as do many other canners. Don't go cheap on jars or lids. And never use the flat pieces for a second time. Use them to store dehydrated food or to store food in the refrigerator. Small batch canning sounds right up my street. I've built a propper store to keep all my produce so I need to find ways to preserve it all! My Mum always used screw top kilner jars...although they are probably pricey too.... if you can find the jars second hand the tops and rubber seals used to be available to buy as they only last so long . Yeah, that works out at over £2 a jar still. I'd be happy to buy a hundred if I could get them quite a bit cheaper. Woohoo great job with the canning. Be aware that this will become addictive! I think i twill! I've always been into preserving things but this opens so many doors! I'm in the US, I usually find jars at second hand stores or yard sales. I used to go to lots of car boots and you'd never see very many kicking round. It's just not that popular over here. Good for you for getting on the canning train. I've been canning for about 35 years (I'm the one that told Kirsty to use the metal lids in the bottom of the canner). Just curious, what did you use as the thickener in your apple pie filling, or did you use any thickener? I make and can apple sauce every year-love it, especially with yogurt. My sister brought me a case of peaches from B.C. this year and we canned about 20 jars. They are so delicious in the winter. If you get a pressure canner the sky is the limit to what you can can. Canning jars and supplies are readily available over here but they are becoming very expensive. Garage sales and second hand stores are a good place to get the odd jar. Good luck with whatever you try next! No thickener used, neither of us fancied it, it's still got a good consistency though and will make a good crumble. 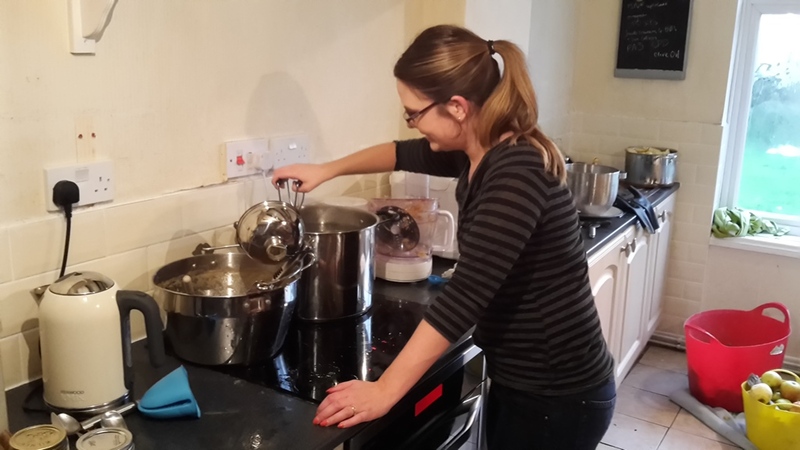 Pressure canner is next on the list but I'm not sure who will get one first - me or Kirsty! We're both really keen. I need more jars first though really! Here in Germany, 'Weck' is the (very old) brand for canning. It seems to be different from the english way - we're using rubberrings and brackets to fix the glaslid while heating the glasses. I got a 'cooker' with a timer. So I don't have to be there in time to get them out. Am I Cruel To My Pregnant Wife?